This species breeds in arctic Russia in Yakutia and western Siberia. It is a long distance migrant. 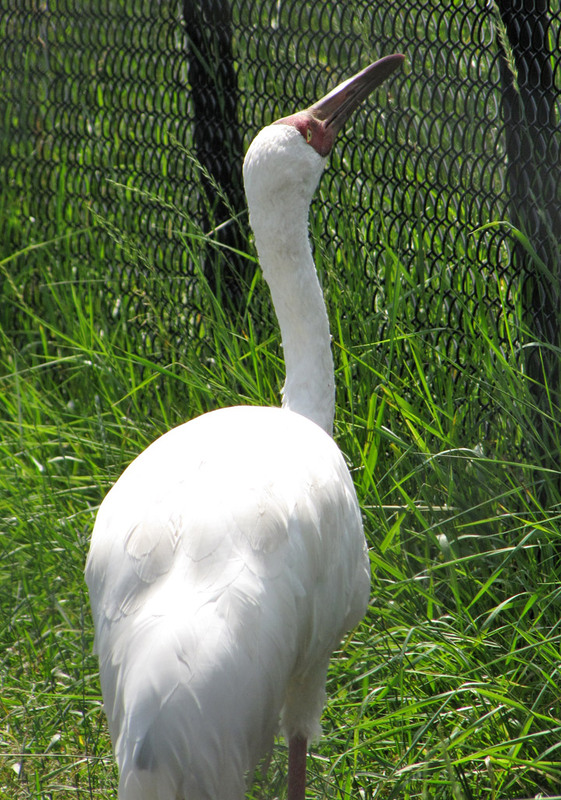 The eastern population winters on the Yangtze River and Lake Poyang in China, the central population at Keoladeo National Park, India (the last Siberian Crane in this population was observed in 2002), and the western population in Fereydoon Kenar in Iran. It breeds and winters in wetlands, where it feeds on the shoots, roots and tubers of aquatic plants. 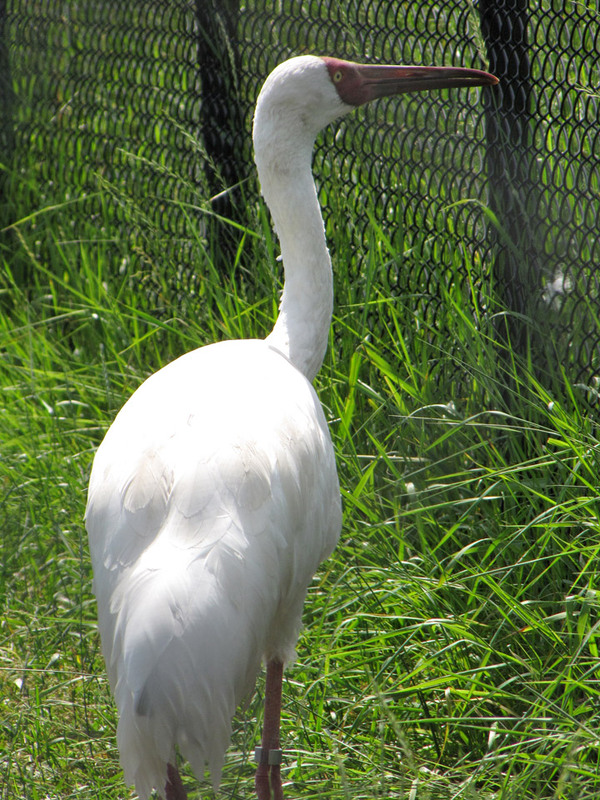 This is a large white crane, typically 4.9-8.6 kg (10.8-19 lbs), 140 cm (55 in), and 210-230 cm (83-91 in) across the wings. Large males can exceed 152 cm (60 inches) and weigh over 10 kg (22 lbs). 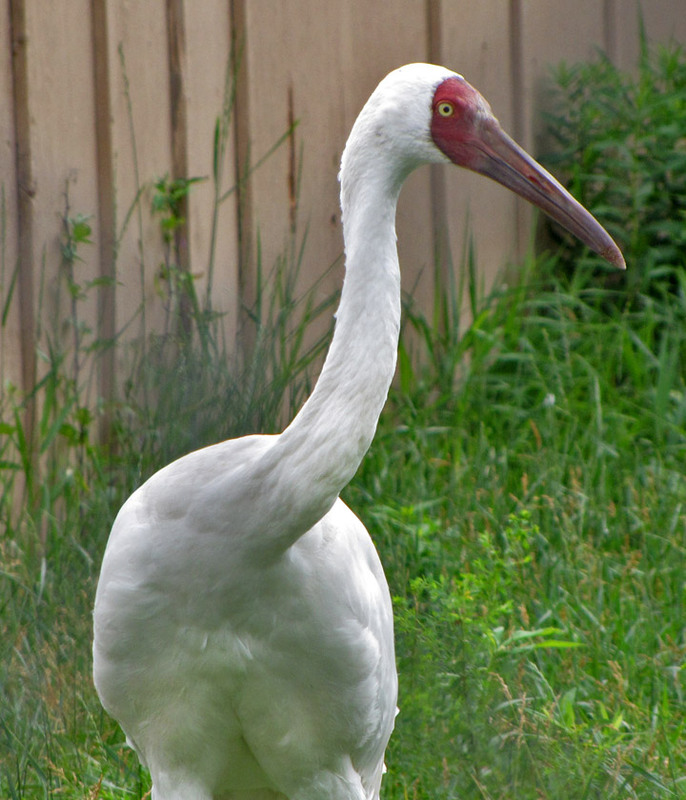 Adults are all white, except for a dark red mask extending from the bill to behind the eye and black primary wing feathers. It has a yellow iris and reddish legs. The male is slightly larger than the female. Juveniles have a feathered mask and buff or cinnamon plumage. The voice is flute-like and musical. A O Hume examined over twenty specimens that he collected and found only aquatic plants in their stomachs. They are however noted to pick up beetles and birds eggs. 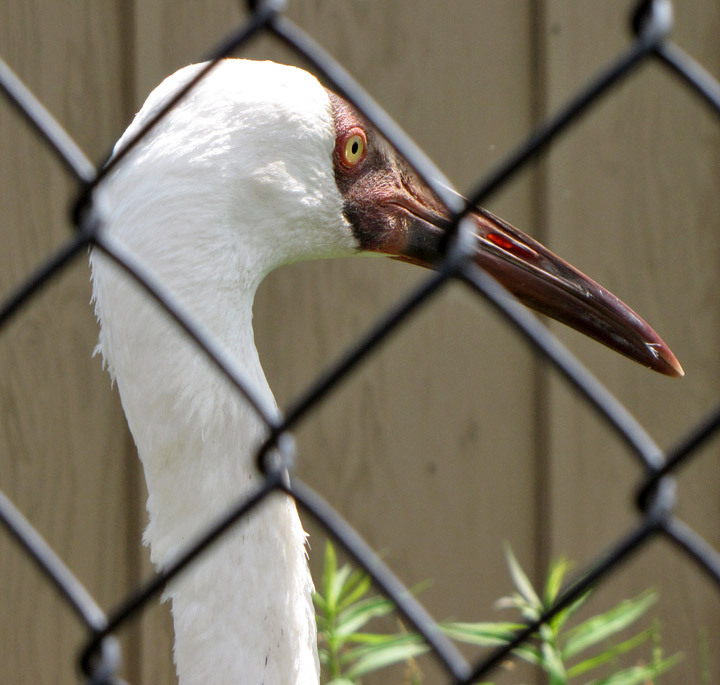 The status of this crane is critical, as it is expected to undergo a rapid population decline in the near future. The wintering site in China holding an estimated 98% of the population is threatened by hydrological changes caused by the Three Gorges Dam and other water development projects. The world population is estimated to be around 3,200. Historic records from India suggest that a number of them wintered there in the past. In fact, Ustad Mansur, a 17th century court artist of Jehangir, was the first man to accurately paint the Siberian Crane. However, the number of birds wintering in India has steadily declined and the birds are no longer found there. 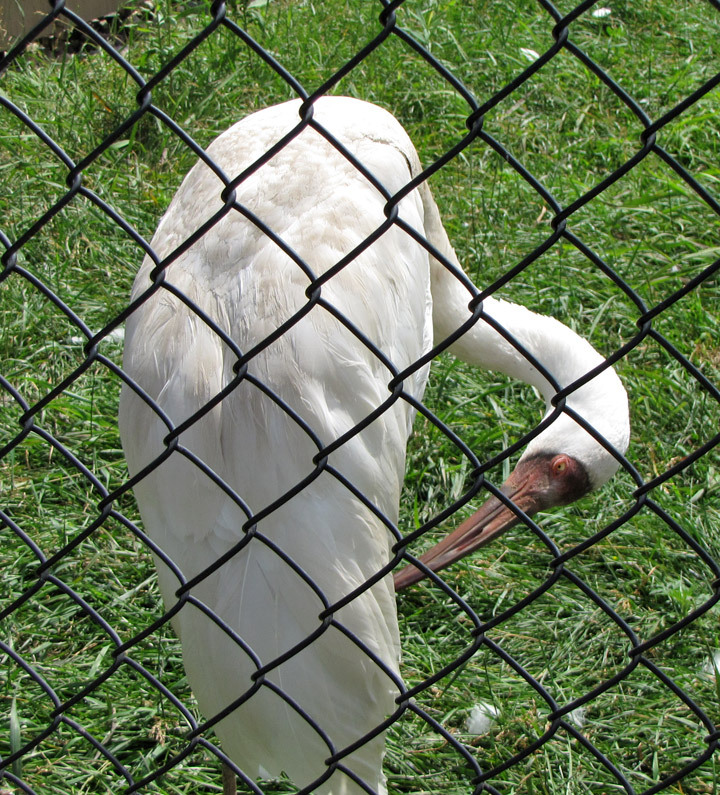 Mr. Rutledge of Entally told me that for twenty years he tried unsuccessfully to get live specimens of this crane, but did not succeed till a few years ago, when he and one of the native dealers got so many that the market was quite glutted, and many were sent to Europe. Since then the bird got scarce again, so this was evidently only a temporary invasion. Satellite telemetry was used to track the migration of a flock that wintered in Iran. They were noted to rest on the eastern end of the Volga delta. Satellite telemetry was also used to track the migration of the eastern population in the mid 1990s, leading to the discovery of new resting areas along the species' flwyay in eastern Russia and China. Researchers are currently tracking two Siberian Cranes banded in Yakutia, Russia and northern Iran, to learn more about their migration routes and summering areas along the eastern and western flyways. 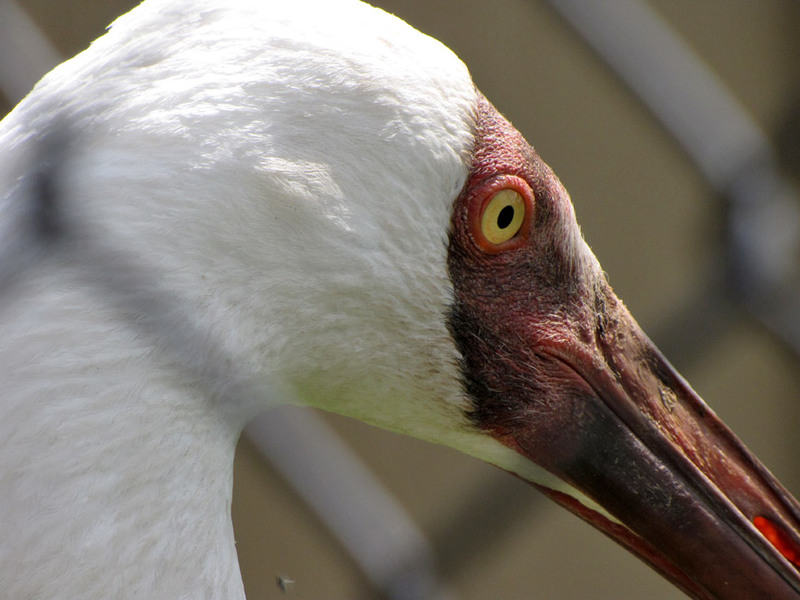 The Siberian Crane is one of the species to which the Agreement on the Conservation of African-Eurasian Migratory Waterbirds (AEWA) applies and is subject of the Memorandum of Understanding concerning Conservation Measures for the Siberian Crane concluded under the Bonn Convention.